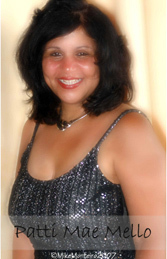 Patricia, Patti Mae Mello, born, raised and currently living in New Bedford, Massachusetts, is the Owner/Event Coordinator of Jazzy-Lady's Productions and the business manager/promoter of Jazzy-Lady's Soul Revue. Patti Mae gives thanks to the Lord for giving her the opportunity to fulfill her vision and the opportunity to be working along side talented vocalists she calls her Guardian Angels and Dream Guys. To perform and watch people enjoy singing and dancing to the great sounds of classic Motown and soul era puts a great big smile on my face. 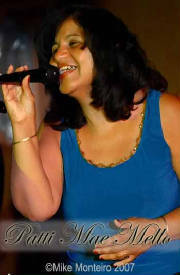 Patti Mae has been involved in the entertainment field for over 10 years. She has over the past eight years worked as an Event Coordinator for Fahrenheit Productions before forming Jazzy-Lady Productions/Jazzy-Lady Soul Revue in 2006. Patti's experience as an event coordinate and the experience of working along side some of the finest artists made it comfortable for her to form Jazzy-Lady's Soul Revue. Patti Mae has coordinated various fundraisers: The Annual All Male Fashion Show Fundraiser, For Your Eyes Only, for the Cape Verdean Recognition Committee (which she created and just celebrated its 3rd year) The Salvation Army Hurricane Katrina Victims, You've Got a Friend Benefit Concert Fundraiser (Brenda Dominic, a Hurricane Survivor was present),Give Love on Christmas Day - Dance Extravaganza Fundraiser - Children Helping Children for The Salvation Army Neediest Family Fund; and The Coastline Elderly Meals on Wheels, Concert Fundraiser for which she received the following awards: Certificate from United States Congress Office, Certificate of Appreciation from Coastline Elderly Services, Inc., Certificate from House of Representatives, Official Citation from State Senate of the Commonwealth of Massachusetts, Official Resolutions from the Mayor of the City of New Bedford, Massachusetts and Last Day of Summer Show of Fashion Fundraiser for the Children Christmas Party for the Woman's Auxiliary of the Cape Verdean Veterans Association. Even though Patti Mae performs as a vocalist and backup singer with the group, Patti Mae is well-known for her love for dancing. Patti Mae attended dancing school at the Joy of Movement Dance Company in Boston and performed with the company back in the late 70s and early 80s. In the early 90s, she performed with the Modern Jazz Dance Co in Providence, RI. Patti Mae recalls that her desire for dancing and performing goes back to her early teen years, where she would gather her two brothers and cousin together on Friday night to practice dancing and singing songs to music from the Motown and soul era and then perform for the family on Saturday evenings. I guess the desire to perform was always there, and now after 30+ years it has come to surface. Like they say, not in your time, but God's time. What a blessing!! !